We recommend the following prescription: Strange Medicine - weird and wonderful stories for all that ails you. Strange Medicine is a fantastic collection of extraordinary tales of transformation by UK weird-fiction author Mike Russell. If you love the strange, surreal and unusual or if you are just looking for something different, Strange Medicine is for you. I've read Mike's book Nothing is strange last year and was totally blown away. Of course when StrangeBooks contacted me to read another his work I was more than happy to say yes. I really enjoyed this book. StrangeBooks generously sent a physical copy and I had an opportunity to take the book everywhere with me. There were some strange looks in the tram due to title and cover but that is the purpose of this type of book. Strange Medicine is not connected with Nothing is strange so you can choose whichever you want to read first but I would recommend you picking Nothing is strange first to prepare yourself. 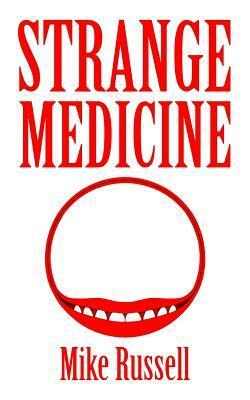 If you are in reading slump, or looking for something different or bizarre than only medicine that I could prescript you is Strange Medicine.